Working with Amazon Web Services (AWS) is actually quite amazing. It is not just a hosting platform – which is all I initially needed when I launched marrspoints.com. You know, the mundane, standard bit of Java, Tomcat and MySQL hosting. After launching the FinTech start-up, TheSubtractor.com, with Scott Scazafavo last year, it has been a fantastic journey into the many application services that they offer as well. It is so nice that the Route 53 DNS service integrates so seamlessly with their SSL certificates and elastic load balancers. It makes certificates dead simple and painless. It feels like the Geico caveman commercials compared to the work of making SSL sites of the past. Email services are a snap with Simple Email Service (SES). Standard email client code such as Apache Commons work right out of the box once your account and domain are cleared by Amazon to send. Email integration is also done so elegantly. With bounce, complaint, and delivery notifications done in their Simple Notification Service (SNS) via JSON messages. The costs are crazy low if you do not mind making the glue to your applications and the services. Even text messaging is super cheap when you move to add texting in addition to email. Need a CDN? No problem, start with some S3 buckets as the backing store, put AWS CloudFront in front of it, add in an SSL cert for the secure pages, and your are up and running in minutes! Again, dead simple to implement. Want to make the image management of your CDN native to your in-house developed tool set (versus using the AWS S3 console to upload files)? Use the AWS SDK in the language of your choice to list the files and upload new ones. It’s a little sad the sub-directories are not real in S3, but with some code you can fake those pretty well. You might want to break out only the services you need in the SDK, as the Java version all up is over 100MB! Need to do some AI or Machine Learning? Amazon has some amazing services that allow you to spin up and only use the compute when you need it. You do not need to build out a Hadoop cluster on a bunch of ec2 nodes – they take care of all of that for you. You supply the PySpark or MapReduce code on top of their Elastic Map Reduce (EMR) services. They are making so many inroads to Big Data as a service that it really lowers the bar of entry for companies to innovate, test and learn with their data strategies. For a number of reasons, I learned to move to Ubuntu 16.04 for my main version of Linux on AWS. Too many 3rd party packages were not available in AMI 2 from AWS. Things like Zabbbix had to be hacked and AMI 2 was way behind on the version of Tomcat in the repo. Issues with the MySQL client libraries also come to mind. Just too much fiddling to get a new node to work with my standard development scheme when they work perfectly from the repos with Ubuntu 16.04 (minus the Oracle version of Java of course). I am sure I am leaving off dozens of items I found along the way of working 100% in AWS for our production site at TheSubtractor.com. It has been a really enjoyable journey. So enjoyable I have not written a blog post since July! We are no longer in Beta and open to all for registration. I could not be more happy with AWS – it does what it says it does, and it is super easy to implement and integrate with all of its other services. Today marks another step along my journey as a co-founder (chief bottle washer?) of a FinTech start-up – we are ready to announce our WolkeWerks Alpha Launch! It was been an interesting and rewarding experience to say the least. My co-founder, Scott Scazafavo, and I have spent most week days with at least one video meeting as we hash through the details of our product and the problems it solves for our consumers. Only two people in the company, and yet we still have multiple locations and a two hour timezone gap. Flexibility is a key to success. To me, we have too much polish and too many features for an Alpha. For Scott, he no longer “cringes” when showing the product to his friends and family. The joys of being co-founders. As usual, things always take longer than one would like or even optimistically estimate. After Scott and I determined the initial high-level plan, we selected a data provider and I was able to produce a proof-of-concept / prototype in one week. WE are REALLY fast we thought. Within a day later, I had skinned the “consumer” version in Bootsrap 3. OMG we are SUPER fast! The prototype made it clear we had all of the building blocks we would need (aside from an army of software engineers, designers, research assistants, etc). If I was able to write a fully functioning, Bootstrap-skinned prototype that was based upon a data service REST API in under two weeks, surely we could get our Alpha product live by April? May at the very latest. Where did it all go Blanche? Hmmm. Oddly, as we launch today, on July 5th, it is interesting to see where the time went. Figuring out the features for Alpha took longer than expected as we scoped the ideas down to the bare essentials. There was over a month spent on looking at technologies and products that we eventually realized would not be used until the MVP phase. A huge help was the book “The Lean Startup” by Eric Ries. It helped us focus on much less and testing our way into changes incrementally (and thus an Alpha, Beta, MVP and the major releases). In the early phases we needed to agree on the basic functionality. We knew the long term product would use distributed processing, AI and machine learning. These are of great interest to me and so I poured myself into learning them more deeply (and getting them working in my lab) as fast as possible. This was going to be a super cool product and possibly even more fun to build! What a dream job! I was a full-time student again. One of our product’s main goals is to help a consumer manage their online subscriptions. My quest for building a Hadoop based AI engine allowed me to add at least five more online subscriptions to my credit cards! I was a super-user and the product was not even built yet. Courses from Udemy, Lynda.com, Coursera, Pluralsight were great! I quickly outpaced the top courses in Treehouse but had fun looking at them. These paid services were in addition to my regular free sites of w3schools.com and others. I was suddenly an online training expert. Visions of blogging about the various online training sites and their relative merits sadly danced in my brain. I took courses about Eclipse, Docker containers, AWS S3, Hadoop, MapReduce, Spark, and stuff I cannot even recall at this point. All of this while building out and upgrading my Hadoop and Cassandra clusters and testing my various theories on how to make the product sing. Then a dose of reality hit as I was working my way through “The Lean Startup” book. Oops. I had gone way too far down that path when we were not even sure of the core viability of our product. There were MUCH simpler ways to achieve the product viability testing we would need without the AI engine working day one. Well that was at least one month of “fun” research that was pointless to our Alpha. Ouch. That was a big chunk of time lost – regardless of how much fun it was. Once I realized I had lost my way according to the “start-up bible”, I quickly re-focused my interactions with Scott. We decided we needed to spend some time in the same city (with a real whiteboard) to flush out the phases of the product roadmap. Scott and I chose Denver as it was in between Seattle and Minneapolis. We used Trello (for free) and carved out what the Alpha, Beta, and MVP versions of the product needed to be (knowing even Alpha would shift as we continued to determine feasibility). I made the mistake of a 5 minutes hack of the consumer site (integrating the authenticated prototype and the new unauthenticated code from Scott). It produced a hybrid Bootstrap 3/4-ish site that I showed to Scott. I think I almost killed the company. It looked OK-ish (to me). Scott was so depressed at how bad it looked he was on LinkedIn looking at Junior Product Manager roles. I realized that incremental crap-ism might not be the way to encourage Scott along the Bootstrap 3 to 4 migration journey. I quickly researched all the issues with making the site fully Bootstrap 4 and re-coding the prototype so it looked proper in both the authenticated and non-authenticated states. Slowly I coaxed Scott back off the ledge when he saw his designs working pixel-by-pixel as he had designed them. Moving from Bootstrap 3 to 4, creating a working rhythm with Scott as he generated pages and updates to the prototype pages took some time, but the pages started looking better and better. Eventually Scott learned how to use GitHub and started making some UI changes directly himself. Now we had put down our rocks and sticks and began cooking with gas. There were some data service issues that we needed to address. Then some AWS issues we needed to investigate and correct, plus redirects, SSL certs, password standards, and a lot of other things that were correctly deemed important into a FinTech Alpha. Then the real fun began. The product was getting close enough, but there were some key features that we felt would make the product more useful and pleasing to our consumers, and there was an issues with “the browser wars” that was likely to cause confusion with our Alpha users. Should we add the features and try to fix the browser wars issue? In the end we decided yes. The additional features required about a day of coding. Well worth it. FireFox, FireFox, why, why, why? We decided we needed to make a valiant effort to correct an issue where browsers were auto-populating our site’s credentials into a third-party access credentials form. We allow our consumers to access their own data through our product, but they need to securely pass their credentials onto their banking service. If the browser auto-populated these fields with our site’s login credentials , the user would likely pass the wrong credentials to the back-end banking service and the connection would fail. It should be easy to stop a browser from auto-populating a form field you would think. Unfortunately, again, no. Here is where the “browser wars” come into play again. The HTML5 specification says that there is a attribute that can be used on the <form> and <input> tags called “autocomplete”. By setting autocomplete=”off” the browser should know not to populate that password field with the current site credentials. Perfect. Except none of the browsers honor it! Protecting the installed base – of course! There is a significant hurdle browser companies implement so users are less likely to consider switching browsers. Many users allow the browser to remember all of their passwords to the many banking, media, and merchant sites they use. Smart users do not use the same password for their favorite recipe site as their investment or banking sites. Who can remember all of those passwords? Let Chrome, Firefox and Edge remember them for you! But once a user has done that, it is way too much work to start over again with a new browser and migrate all of those passwords (that they really don’t remember) along with them. Great product management by the Chrome, Firefox and Edge teams in protecting their installed bases. This is all fine and dandy, until a site needs to be sure the consumer is not confused when a different set of credentials are being requested. Auto-populating credentials (especially when they should be different than the site they are on) may cause less sophisticated users to submit the wrong credentials. This further confounds the user experience and frustration levels. Interesting enough, on a blog from the Mozilla Developer Network, there is an article that explains a simple way to stop the browser from auto populating the forms fields. And guess what? It works for the latest versions of Chrome and Edge – but NOT FIREFOX!? Mozilla explained how to correct the issue (autocomplete=”new-password”) – but then explains they ignore that as well. Why would Mozilla do this? Because they have been losing market share to Chrome for years – and they need to be more aggressive in their product design to capture and keep new users by storing their password at all costs. Sad. So after a month’s travel down a wrong road along the course of developing our roadmap, we have finally gotten to the day of our Alpha release. We need to remind ourselves it is not an MVP or a Beta – it is just an Alpha. But to me, an Alpha that is pretty slick and does a lot of what we will need it to do as we roll towards Beta and the MVP. There are many features left for Beta and the MVP as well as dusting off the machine learning and AI code – but we are on our way! Scott Scazafavo and I have been working full time on our new start-up, WolkeWerks.com. This often places me in my home office reaching out to colleagues for advice and collaboration. My communication tool of choice has been free peer-to-peer (P2P) video conference tools. Scott and I have used Skype and FaceTime, but experienced the common video lags and garbled voices. These were frustrating experiences needless to say. My dad used to say, “I don’t need an entire house to fall on me to learn something, it only takes a garage”. I think he was telling me to learn from trends when they are still small – and even a garage hurts when it falls on you. The second time someone (ok a nice recruiter) asked me connect with Zoom, I realized it was a high quality service in terms video choppiness and garbled voices. I did not look into pricing as I figured it was another service used by larger corporations ala WebEx or BlueJeans. When a colleague in Berlin sent an invite with it, I thought it was odd that he was willing to pay for a service just to chat with me. This was on top of another colleague with a pending Zoom call scheduled. Why does everyone want to see a bald guy on video when it is such a frustrating technology? Because it really isn’t frustrating anymore. At least from my sample set of 4 calls now. One to Boston, one for two hours to Berlin, and two to different people in Seattle now. But the biggest surprise, it is FREE for 2 people for unlimited connectivity. It is also free for 3 or more people for 40 or less minutes. FREE is my favorite word as I am an unabashed open source bigot. But FREE that really works well is amazing. I love the idea of getting people to try something for free for personal use and then once they fall in love with it, they are happy to pay for it in other circumstances. I have not tried a 3 or more participant call yet. I suspect they have this technology so dialed in that once you do a 30 minute call with 3/4 people that runs long, you get hooked on how well it worked and add your credit card to the account. The folks at Zoom also have connectivity modules and upgrades for H.323/SIP systems, LifeSize, Polycom, and Cisco gear in corporations. It is all on their website. They seem like they really nailed the tech on this so far. I have a call Monday to London with another colleague. I would never have asked him to use video conferencing in the past. Too clunky and messy. But we are setup on Zoom and it will be good to see his face for the first time in a year – even though we catch up nearly every month. Check out Zoom. All it takes is a laptop, iPad or a mobile phone. 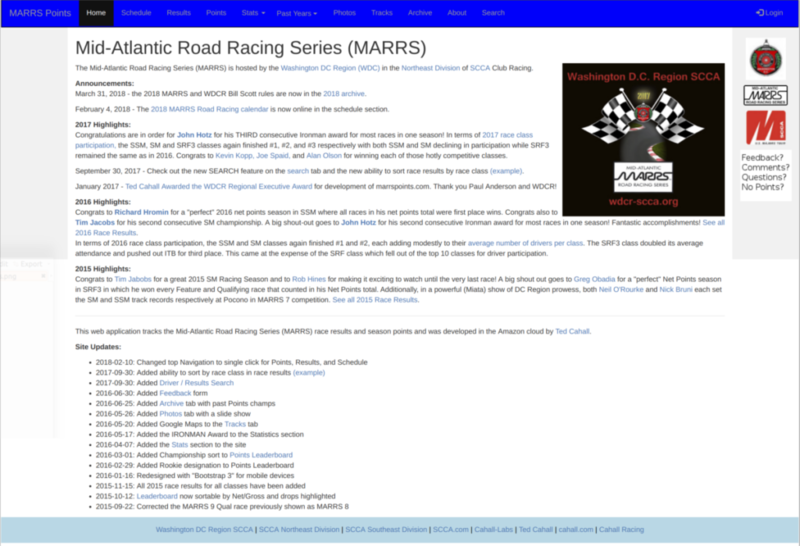 The marrspoints.com racing application recently got some SEO updates. These we long overdue in terms of getting better ranking inside Google. Now driver’s season results URLs include the drivers name (example for Mike Collins) and the race results include the race name and classes (example for 2017 MARRS 5 SM Feature race). Most importantly the Points Leaderboards have the class name and season as part of the URL now. On top of all of that, I automated the sitemap to build nightly and worked with the Google Search console to fix duplicate title tags and content descriptions. Enter Tuckey – SEO URL Rescue! This all should have been done long ago. But features were my first priority. I used the Tuckey urlrewrite filter for all of the friendly URL magic. It really is awesome and I am glad I remembered it from all the way back to my CNET days when we used it on a project there. Since I left Digital River at the end of February, I have been working closely with Scott Scazafavo on a stealth start-up idea we had been kicking around. Most mornings I hit my office early and attempt to further the research or code base. I worked on some Java REST API code I wanted to improve from its early usage at marrspoints.com. I remembered there was a simple test site that gave canned responses to HTTP GET, POST requests along with cookies and the likes. After a tad of searching, I found it again: httpbin.org – what a nice tool. Simple yet elegant – and great for testing out HTTP code samples where you just need a simple endpoint. Tutorials on the Internet should just use this site in their examples – as it likely will not change much. This is where the danger began… As I was done using it for the simple testing I was doing, and was ready to move onto the next phase, I noticed that it had the authors name with a hyperlink. Since I wished I had written such a useful “demo” or example.com website, I wanted to see a tad more about him. Through Kenneth Reitz, I learned that I comparatively don’t have many cool hobbies or talents (I am not that great of an auto racer and I have not written books, published music, been a professional speaker or even amateur photographer). That is all on top of his enormous contribution to the Open Source space. This guy is REALLY talented. Through his link on his personal values, I saw another link stating that “Life is not a Race, but it has No Speed Limits”. Of course that deserved a click! Through Kenneth and that link, I met (online so to speak) Derek Sivers and read his axiom – that “Life Has No Speed Limits“. And though that story, the life of Kimo Williams and why focus matters. Focus? On the Internet with so many lessons to learn? OK- back to that focus thing and getting some work done. I hate to think of myself as a tech Luddite. Being an Ubuntu Linux fan has caused familiarization with the Unity desktop. Recently, I have been playing with 17.10 to see what is coming in 18.04 LTS. I never thought I would defend the Unity desktop as my earliest Linux days were split between the Gnome and KDE desktops. But I wish I had my old Unity back. Yes, I know I can return to it in 17.10 – but it is becoming mostly unsupported. Incremental scaling is essential with today’s 4K monitors. Or I need Lasik. Uber-Lasik in my case. I never actually run the first point release of an LTS version. I waited for 16.04.1 to get anything real live on 16.04 LTS. It seems the Gnome desktop has a big memory leak and it likely will not be fixed in the 18.04 LTS initial release in April. OK, scratch moving to 18.04 LTS in April on anything I need. I already am a desktop memory hog as it is and finally upgraded my new desktop machine to 32GB of RAM. I know this is all for the good. That change thing. Moving to Gnome in this case. It is far more widely supported and used across more variants of Linux. I used to be a CentOS champion as I loosened the evil grip of RedHat subscription fees back in my AOL cost cutting days. I have since become almost an exclusive Ubuntu home data center. Seems I will be straddling Gnome and Unity for a year or so. One other word of caution, the Gnome 3.26 desktop (used in 17.10) does not truly support incremental UI scaling yet. This is a problem for people like me with a 4K laptop screen or large 4K desktops. There is a workaround. However, it is not clear if fractional scaling will make it into Gnome 3.28 which ships with 18.04 LTS. Happy times. It is really hard to see my shell windows in a non-scaled up Gnome desktop on a 4K laptop screen. I just realized that I bought my “new” Windows 7 machine way back in late January. The thing is amazing: 8GB RAM, i7 860 Quad Core CPU, 3.0Gbps RAID-1 SATA drives, etc. I recently went out and bought a 30 inch Samsung monitor so I could put the video card in 2560×1600 mode. The speed, video, stability, etc. of this machine are incredible! Additionally, Microsoft has tossed in some FREE apps that were not available under XP as part of their Windows Live Essentials program. The most significant of those apps (to me) is Movie Maker. I regularly edit and upload portions of my SCCA Club Racing videos using Movie Maker. It is simple and easy – which fits my video skill level really well. I am also in the process of adding in a TV Tuner card so I can really utilize the Windows Media Center software that came with my Windows 7 Ultimate version. That should make it even more interesting to connect to my Xbox-360 (which now gives my AppleTV a run for the money in renting movies from the Internet). I now regularly run over 3GB of apps without any issues on the machine whatsoever. I have not added all the DB servers, app servers, etc. that I used to run on my various Windows desktops. That is because I never retire my old machines and they are still on the network somewhere. I finally have created what is mostly a desktop machine used as a desktop. No question, Windows 7 is a really fantastic OS. It will continue to be my main machine to access all the servers running in my in my home data center.